When the InSight Mars mission launches atop an Atlas V rocket from Vandenberg Air Force Base in California, two mini-satellites will be riding on the same rocket. The twin spacecraft, called Mars Cube One (MarCO), are the first NASA CubeSats designed to operate in deep space. The MarCOs were built at the U.S. space agency’s Jet Propulsion Laboratory (JPL) in Pasadena, California. The basic CubeSat unit (CU) is a box approximately 4 inches (10 centimeters) across. Larger CubeSats are multiples of that unit. As such, the MarCOs are six-unit CubeSats that are roughly the size of a briefcase when stowed for launch. The MarCOs are intended to follow InSight on its journey to the Red Planet. If they survive the trip, they will each use their folding high-gain antenna to relay data about the lander as it enters the Martian atmosphere and touches down on the surface. As the InSight lander can use its own communications equipment or the current fleet of Mars orbiters to transmit data directly to antennas on Earth, the MarCOs aren’t required for mission success. 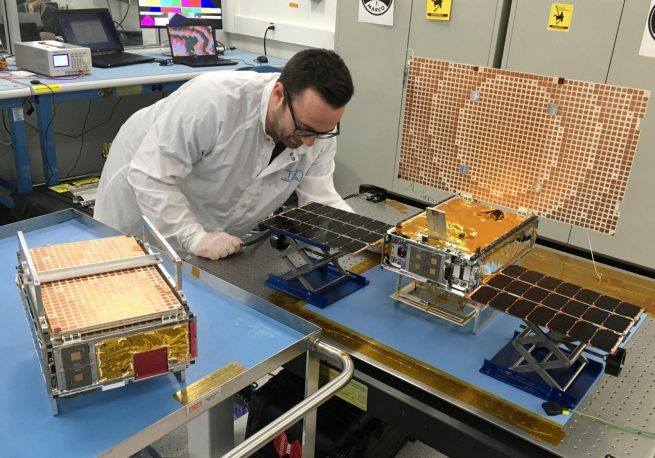 The twin CubeSats are, however, a test of the mini-satellite technology in deep space and are expected to demonstrate how small satellites could be used to further explore the Solar System. While the two CubeSats are officially named “MarCO-A” and “MarCO-B,” the mission team has nicknamed them “Wall-E” and “Eva.” Both of the spacecraft use a compressed gas often found in fire extinguishers to propel themselves through space, just as Wall-E did in the 2008 Pixar film of the same name. There are expected to be several challenges for the first CubeSats to travel to Mars. The first of those will be simply switching on, according to NASA. NASA said the batteries where last checked in March by Tyvak Nano-Satellite Systems of Irvine, California, before the satellites were inserted into a special dispenser that will propel them into space. These batteries will be used to deploy each CubeSat’s solar array and to switch on their radios if there is sufficient power remaining. If the power is too low, the mission may not hear from the spacecraft until they are more fully charged. According to NASA, if both MarCOs survive their interplanetary journey, they’ll test method of communications relay that could act as a “black box” for future Mars landings, helping engineers gain a better understanding of the difficult process of safely landing a spacecraft on Mars. Additionally, NASA said the MarCOs could also help demonstrate that CubeSats are ready to go beyond low-Earth orbit and out into the Solar System. CubeSats were initially developed to teach university students about satellites and give them hands-on experience building flight hardware. Today, CubeSats have become an important commercial technology, gathering data on everything from shipping routes to environmental changes, NASA said. They are even brought to the International Space Station via the various cargo freighters to be deployed via the Kibo module’s equipment airlock. NASA researchers said they have future plans to use CubeSats for planetary exploration. JPL has its own CubeSat clean room, where several small satellites have been built, including the MarCOs. Such projects could give young engineers the opportunity to build something that could reach Mars in just a few years, rather than a decade, the space agency said.